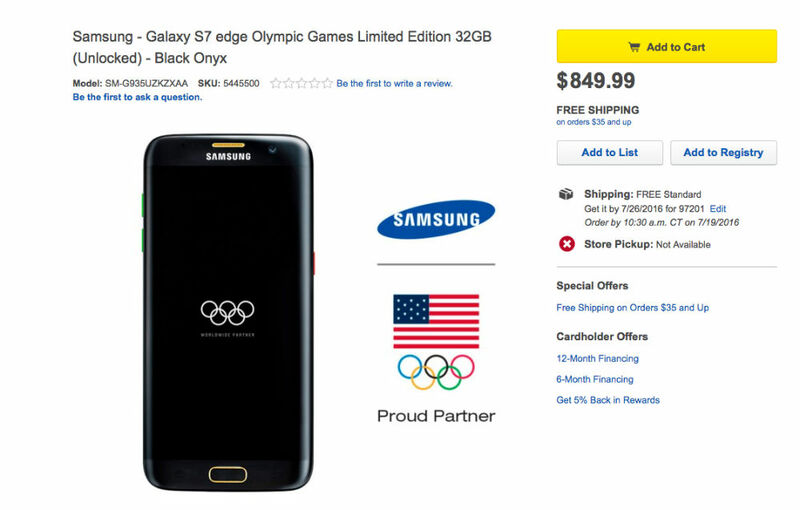 Those looking to get their hands on the limited Olympics Games Edition of the Galaxy S7 Edge can now do so via Best Buy’s website. As far as we can tell, the device is an online exclusive, meaning you won’t find it at your local Best Buy retailer. Priced at $850, this model of the Galaxy S7 Edge will cost you a bit more than a standard S7 Edge, but given its limited availability, this is no surprise. The difference between the Olympics Edition and a standard model is nothing crazy – the phone features a special Olympics 2016 UI, including themed Samsung apps, on top of the obvious Olympics hardware theme. There are Olympic colored buttons and the Olympic rings are featured on the backside, allowing everyone around you to know that you take the Olympics very seriously. If you did not already know, this device is being given to each Olympian from the US headed to Rio this year. There’s no telling if they will be using it, but I don’t see why they wouldn’t. The phone features a very good camera, great display, and has IP68 water resistance. It’s perfect for any Olympian.